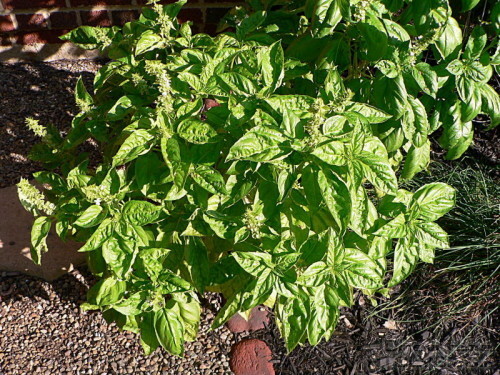 Pesto is usually thought of as something that you put directly on pasta. But it also makes a great ingredient to keep on hand for making a quick spaghetti sauce, or for a burst of flavor in soup or stew. 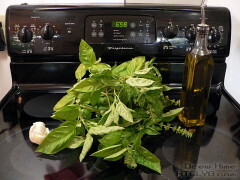 I really should be saying “basil pesto”, because you can make pesto from any herb. “Pesto” refers to the technique. 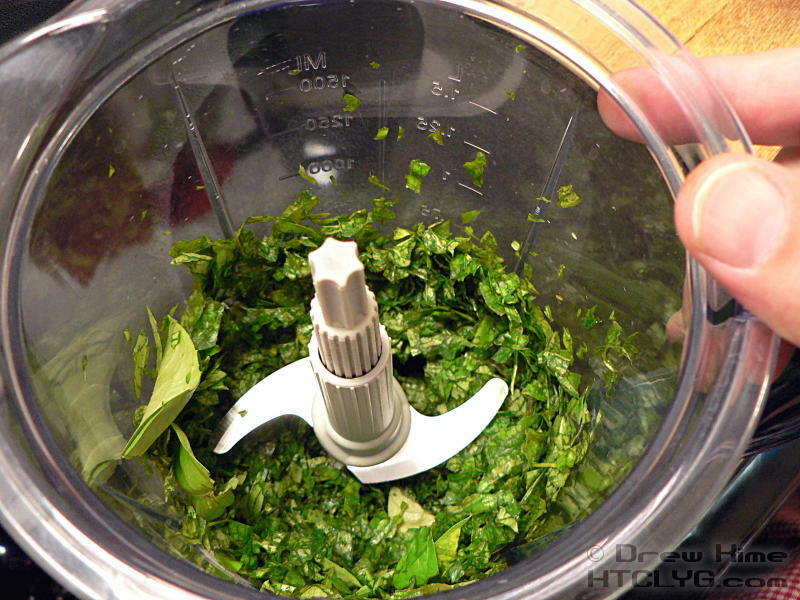 Traditionally, pesto was made by mashing the herbs in a mortar and pestle — pestle, pesto, get it? This batch came from my garden. 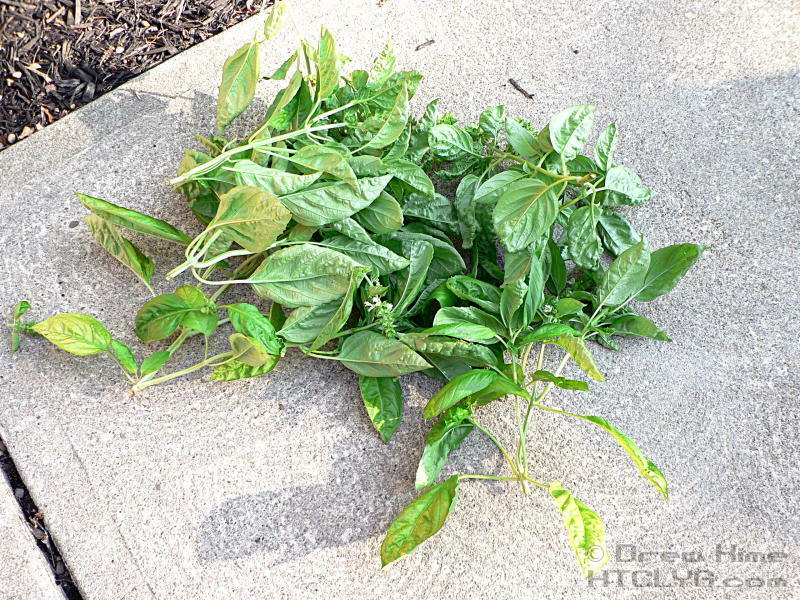 Cut off whole branches and peel the leaves off. You don’t want thick stems, so fold each leaf in half and peel the stem off the back. 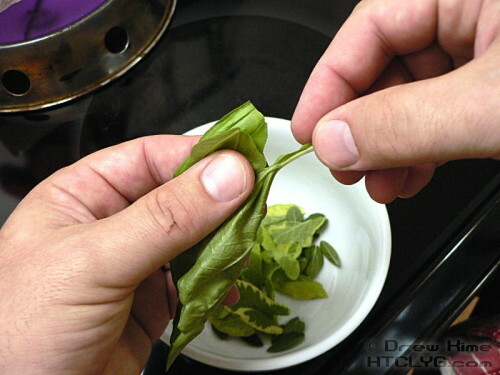 Yes, it’s tedious peeling the stem from each leaf one-by-one. 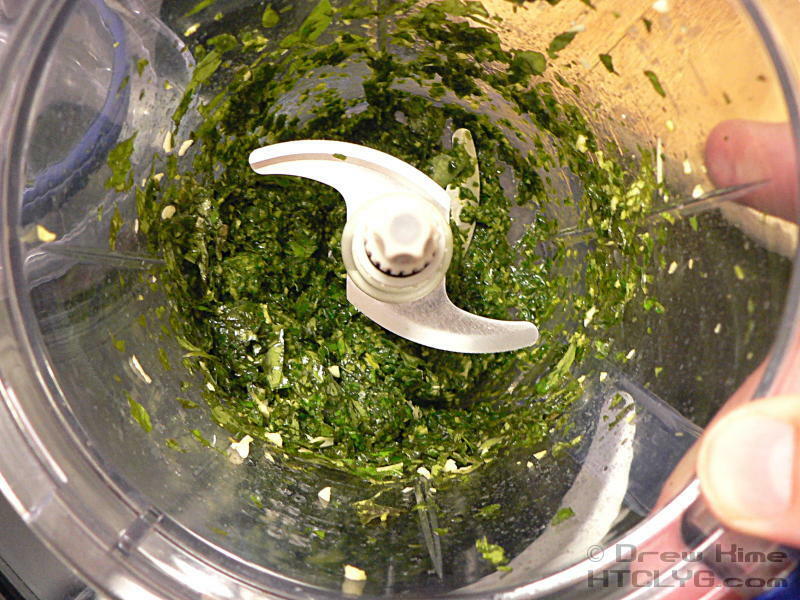 The alternative is getting tough, stringy stems in your pesto. Ecch. Fill the sink with cold water and rinse the leaves thoroughly. You can buy various products to add to the water that claim to remove pesticides and fertilizers and other stuff that you don’t want to eat. But I didn’t use any of those things, so I was just rinsing off the dirt that splashes up when it rains. 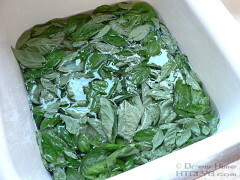 After the leaves are thoroughly rinsed, dry them. 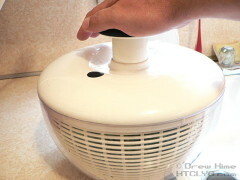 I haven’t found anything better than the Oxo Good Grips Salad Spinner . 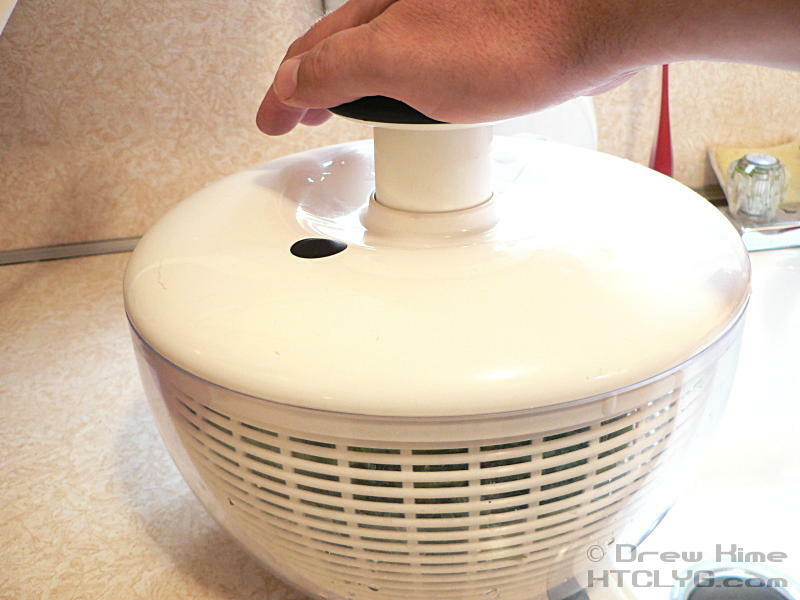 It’s a mini-centrifuge that spins all the water off the leaves without damaging them. Even after shaking the leaves off, the spinner removed all this water from them. Remember this when you see how much finished pesto there is at the end. My last batch of pesto was a little light on the garlic. So of course I overcompensated this time, using about a dozen smallish cloves. Cut the stems off, but don’t bother chopping them up. The food processor will handle that. 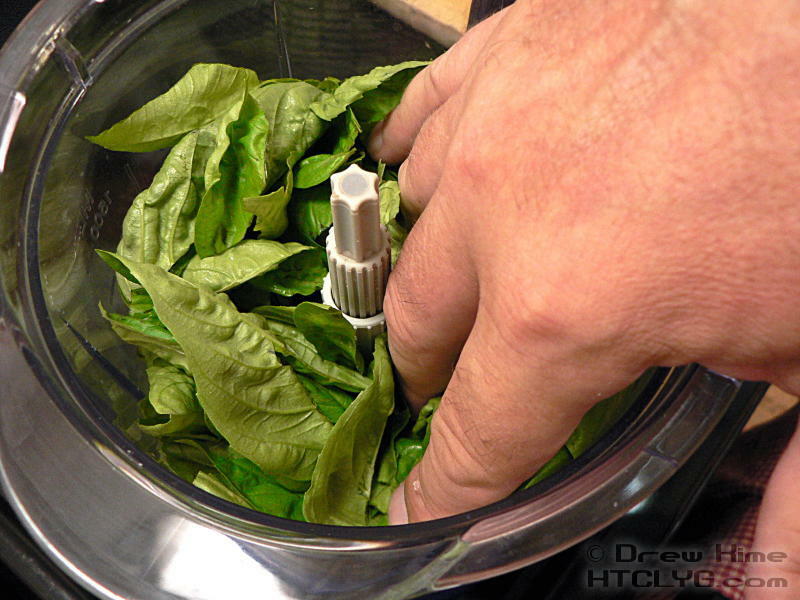 Add the garlic and all the clean basil leaves to your food processor. Stuff it in if you have to. That’s the Ninja Master Prep I’m stuffing the leaves into. It’s got a two-quart pitcher, so you can see I had quite a bit of fresh basil to start. After a quick couple quick pulses, the volume was already reduced quite a bit. Add about a tablespoon of olive oil and process for about 10 seconds. Scrape the sides down. Keep adding oil a teaspoon at a time and processing until it starts to get a creamy texture. You want a thick sauce, not a bowl of shredded leaves. 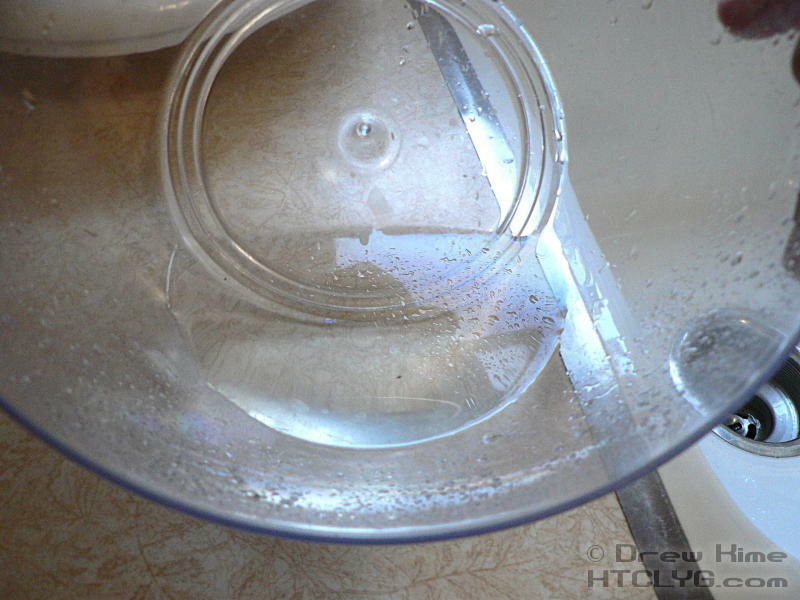 When I was done, the volume had reduced to this tiny little bit in the bottom of the pitcher. I used the smallest plastic containers I had. I could have fit it all in one of them, but Lou (my father-in-law) wanted some. Tomorrow I’ll show the most basic way to use this. 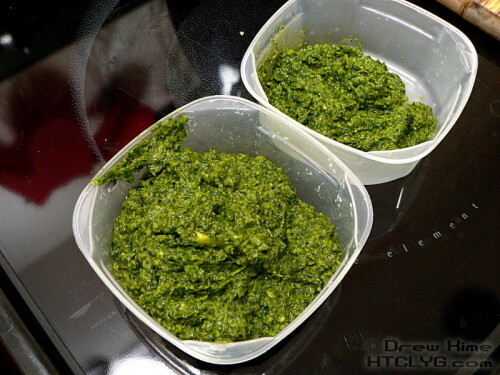 If you want ideas today, I’ve already done pizza sauce and bulk spaghetti sauce using this pesto. 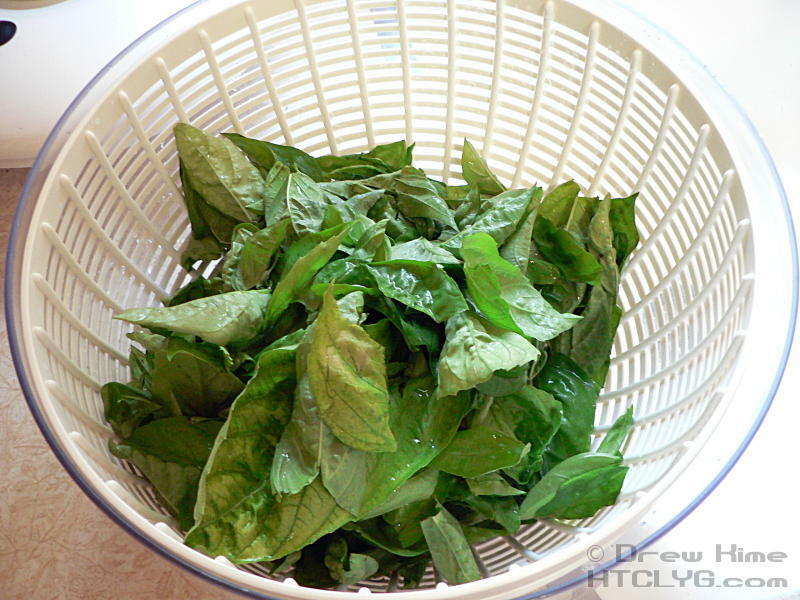 Wash and dry the basil leaves. For each quart of basil, use about 3 to 5 cloves of garlic. 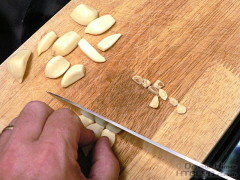 Peel the garlic and chop the stems off. Put the garlic in the food processor first, then add the basil on top. Pulse a few times until the leaves are reduced in volume by more than half. 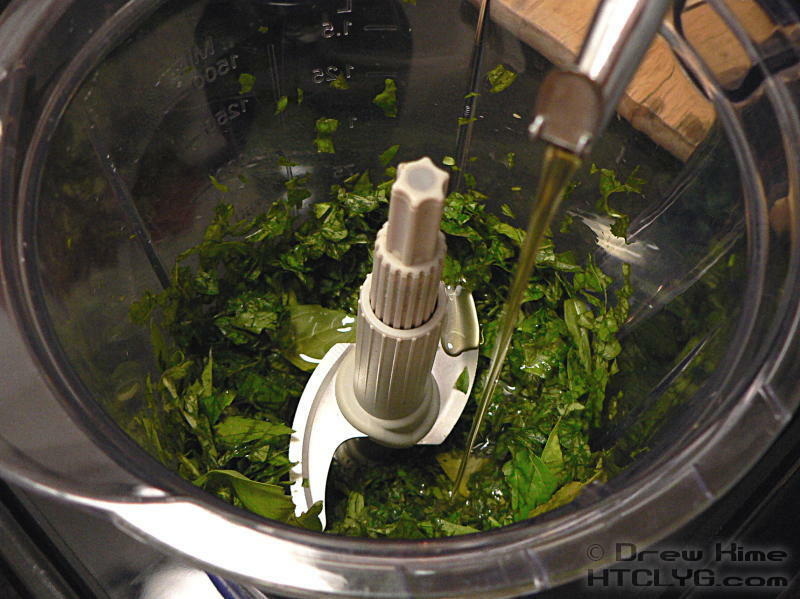 Add a tablespoon of olive oil and process for about 10 seconds. Scrape the sides down and add another teaspoon of olive oil. Process another 10 seconds. Repeat until the pesto becomes thick and creamy, not just a bowl of chopped leaves.